Every day in the Coachella Valley thousands of people drive along streets with names like "Bob Hope," "Dinah Shore," and "Frank Sinatra." 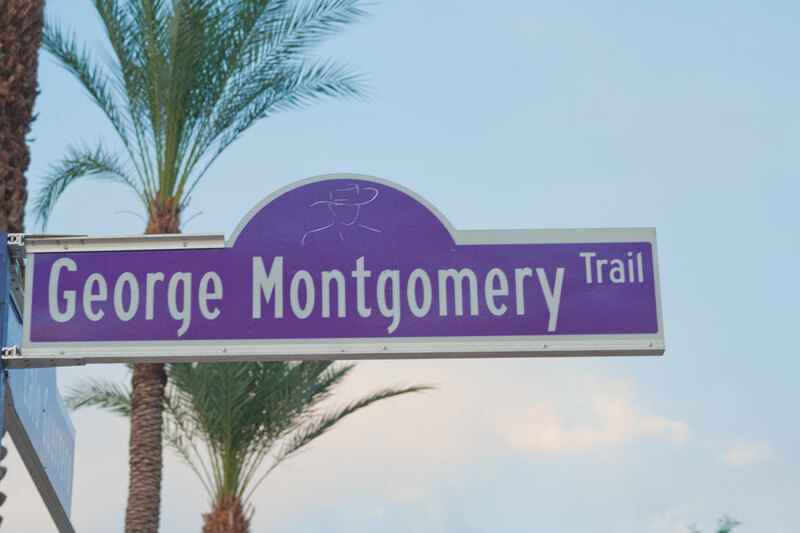 In Cathedral City there is "George Montgomery." While you may have heard about or are familiar with the stars of most of the streets in the Coachella Valley, George Montgomery may have slipped by many minds simply because he worked mostly on Western films, a film genre that's not all that popular today, like it was in the 1930s and 40s. Gee, these blasts from the past get confusing for me. 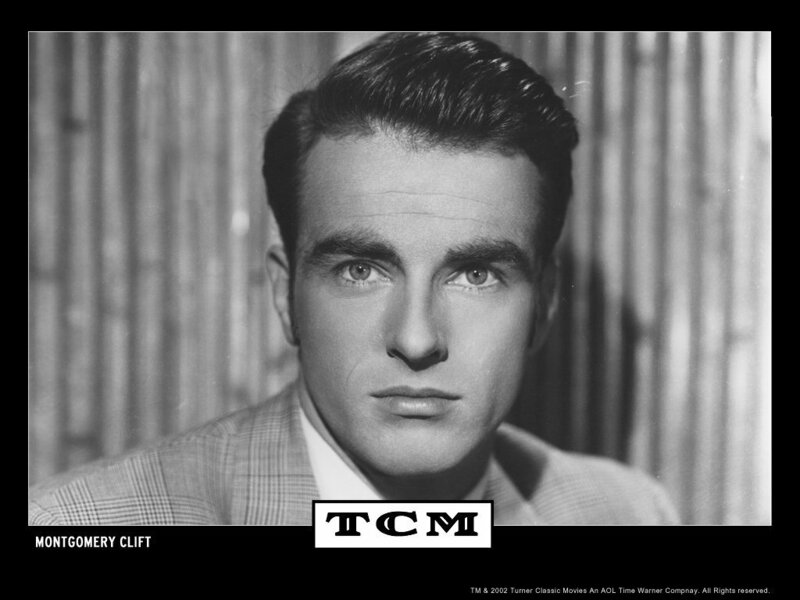 For one they all look alike to me (white, dashing and sophisticated) and two, their names can be mixed-up--think about it--both George Hamilton and Montgomery Clift have part of George Montgomery's name. All three seem as if they came from the same era, a time and place anyone under 60 might not familiar with. The actor did have connections to Palm Springs. He lived here and he married one of its most famous residents, Dinah Shore. More about her in a future post. In the 50s and 60s Tiki (the Polynesian God) was a fashionable outdoor sculpture for the Palm Springs modern home yard and/or garden. Made from the Washingtonia palm tree trunk, this gargantuan ornament added a little fun and humor to the streamlined modern architecture of the day. In the late 1990s the Tiki God made a come back. For the past 12 years it has been part of the hipster lifestyle of Palm Springs. 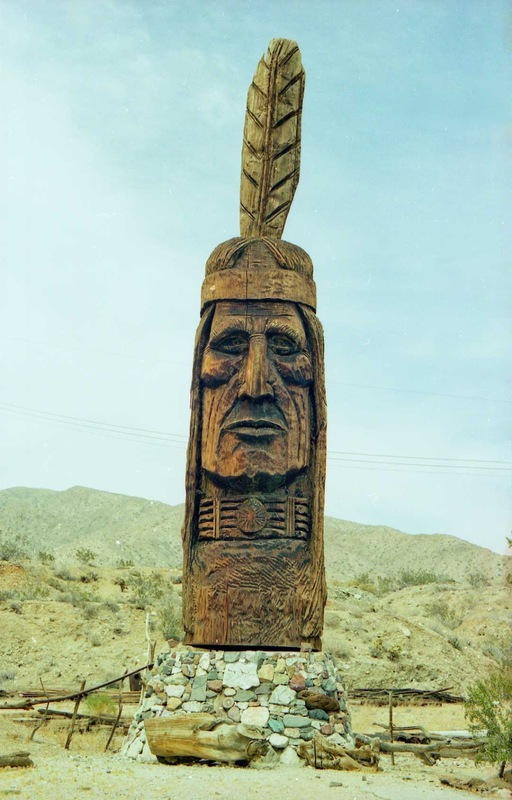 The Tiki God to the left was made from an image taken in 2004 in Desert Hot Springs. The original photograph was a film negative. I recently scanned it and played around with it in Photoshop. Just click on it and you'll see how it looks in a variety of frames and on canvas. I plan on making many more of these from my photographs of different Tikis that I've found in Southern California and Hawaii. Note the trunk has been turned upside-down so that the roots make perfect hair for the figure. Pretty clever invention. If you really like the style there are dozens of Tiki-styled accessories and books for your home. There's something to be said about the wear and tear signs endure over the years, making them into a unique work of art filled with patina. Time also has a way of rejuvenating monuments such as this, especially with when there are handy humans around. 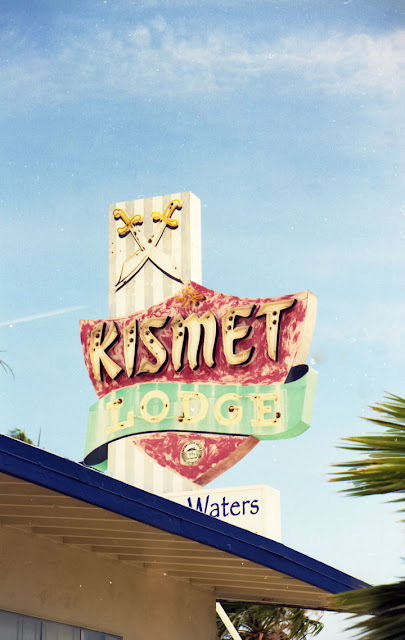 The Kismet Lodge sign today doesn't look like the one of yesteryear. The owners of this clothing optional resort in Desert Hot Springs are proud of that sign, including it on their webpage. The sign was built in the 1960s. Today the Kismet is called the Living Waters Spa. You see, Desert Hot Springs has always been an LA getaway because of the natural hot springs in the area. City officials in the torn and tattered area have been trying to clean up the town's bad reputation. In this barren windswept town, prisoners on parole roam freely because Desert Hot Springs is the furthest place some LA parolees can go from LA without violating the rules of their probation. Is the Cool Weather Over for Good? Marine layer on the edge of Palm Springs. Can we say goodbye to the marine layer's cooling effects for the next seven months? It's over 100 degrees in Palm Springs today and people are not used to it yet. Will there be more? The answer is yes, and a whole lot more, but don't fret yet, as we'll get some cooling here and there up until June as the the "June Gloom" sets in on the coastline, pushing cooler air into Palm Springs. After June, it will be hot, hot, hot. We get temperatures of about 112 degrees every day with hot spells pushing the thermometer up past 120. That's not all the bad news. 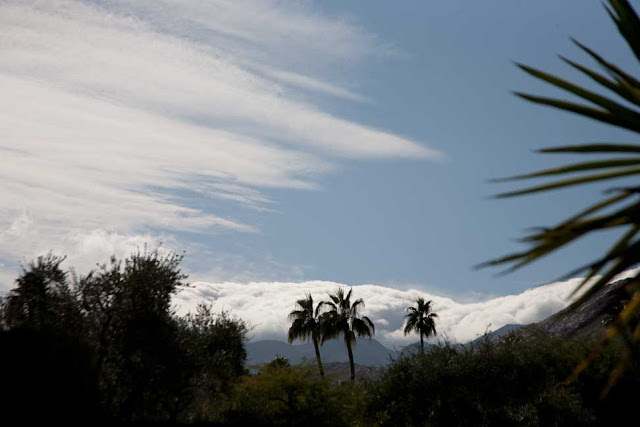 Palm Springs had one of the highest early morning low temperatures in the world. On July 13, 1985 the low temperature in Palm Springs was 105 degrees. Ouch! Back in 2003, I took a tour of DHS (Desert Hot Springs) and found this Indian head. It's very tribal looking. This Indian head was taken back in the days of film photography. I didn't have a digital camera yet. I've been come across this image and others like it recently. They're scanned from old film images as I go through my old film negatives. I didn't think there would be anything about this on the Internet, but there is at RoadsideAmerica.com. This Indian head is in front of Cabot's Pueblo Museum in Desert Hot Springs, CA. Peter Toth sculpted it, an interesting artist who sculpted one of these heads in every state. Each sculpture Indian head sculpture has a tribal leader's name. Palm Springs newest hipster hotel is the place to see and be seen. Stephanie Theobald quoted the general manager of the funky Ace Hotel and Swimclub in UK's Gaurdian as commenting that this boutique hotel and others like are creating a kind of West Coast Hamptons. The hipster getaways are springing up in what some call a mid-century modern Disneyland are changing the face of the city. So what makes them tick, oh, I mean hip? 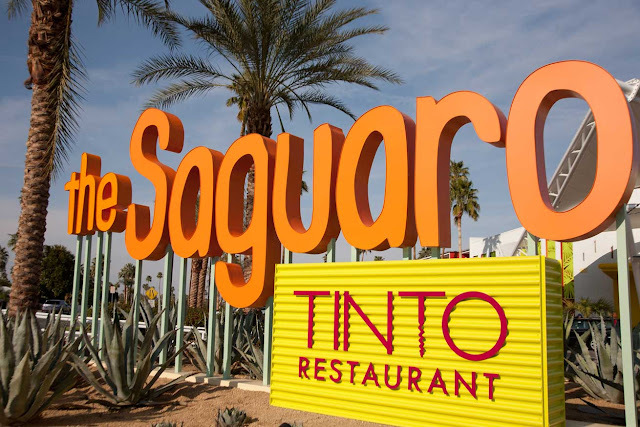 It's the color in Saguaro's case and the lack of color in the Ace Hotel's case. The former is housed in a transformed Holiday Inn that went bust, painted in colors the city once prohibited; the later in a black and white building that looks like it was 1960s Denny's attached to a drive-in motel. 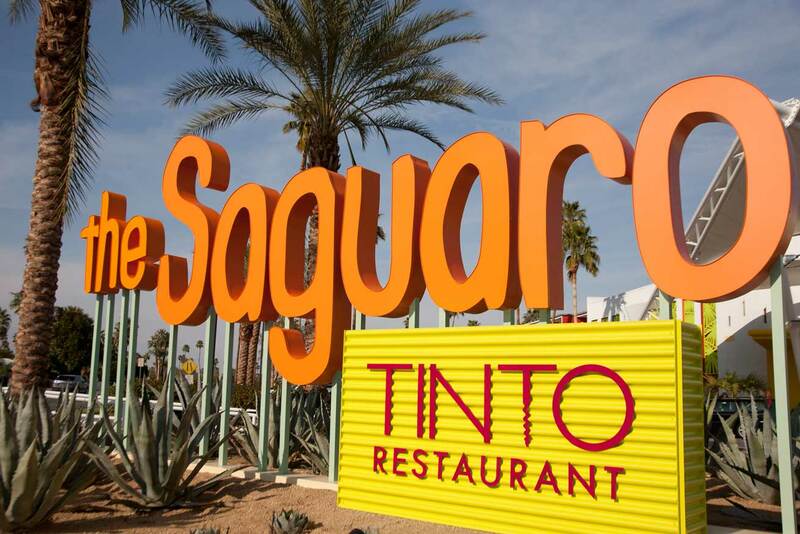 The two hotels are a must to visit or have a meal as they offer abundant relaxation nooks and varied cuisine that ranges from tapas at the Saguaro to black bean burgers, my favorite, at the Ace. Both hotels welcome visitors who are free to roam the premises with welcome arms. If you want to swim, you can for a nominal daily use fee. Don't miss out visiting both of these for a casual breakfast, brunch, lunch or dinner. One more tip--the sweets at the Ace are homemade and some of the most satisfying I have every eaten.